This year, Mason & Mason Assurance Group, Inc. has partnered with Mike's Bikes to help us collect bicycles in Massachusetts for the Mike's Bikes Foundation Africa Bike Drive. So far, they have collected more than 350 bikes, but they need your help to get to their goal of 500 bikes by the end of September. 500 bikes is the number of bikes that can fit in a full shipping container, bikes that make a difference in so many people's lives. How can you help? If you are in the Bay State (not the Bay Area!) 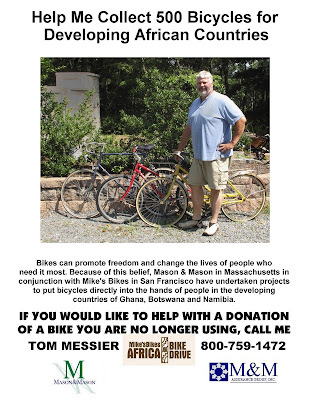 and you have bikes you would like to donate, please contact Tom Messier at (800) 759-1472. If you're not in Massachusetts, you can still help by posting this to your friends, Facebook, Twitter, etc.